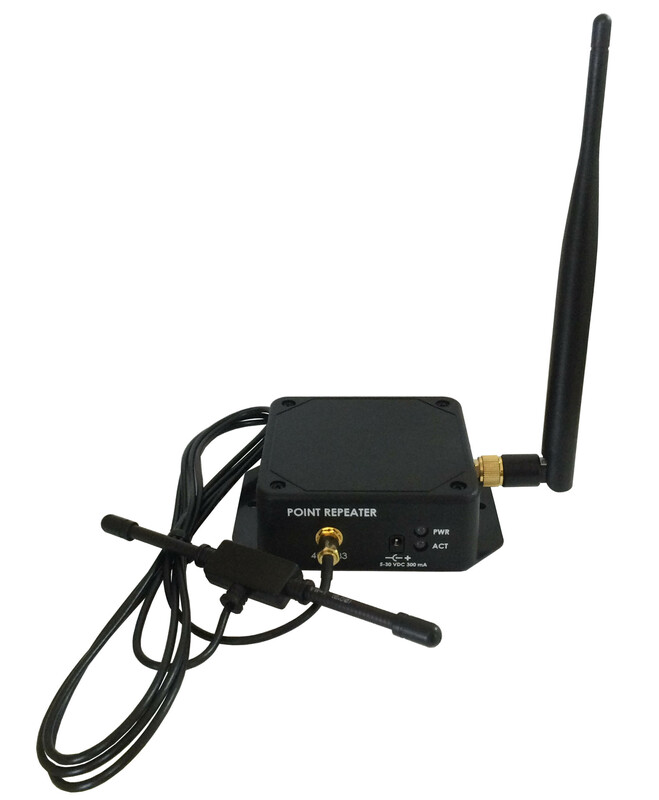 The Point Repeater 4.9.9 is a 418 MHz RF receiver with an integrated 900 MHz transmitter. It receives CRC-16 error-checked data packets from Point Six Wireless 418 MHz and 900MHz radio devices, processes the data, and then transmits the data to Point Six 900 MHz devices. Multiple repeaters can coexist and can communicate with 900 MHz Point servers, Point Managers, Point Repeater 9.9 mesh repeaters, and other Point Repeater 4.9.9 mesh repeaters. The Point Repeater 4.9.9 can be configured via the 900 MHz radio interface for network specific operation. The Point Repeater 4.9.9 provides a means of extending the range of 418 MHz battery powered sensors, 900 MHz. sensors and controls into a mesh network of 900 MHz Point Repeater 4.9.9 repeaters, Point Repeater 9.9, and Ethernet connected servers and managers. As many as 26 layers of Point Repeater 4.9.9 repeaters can coexist. The Point Repeater 9.9 is a 900 MHz RF Mesh Repeater. It receives CRC-16 error-checked data packets, processes the data, and then transmits the data to other Mesh Repeaters, Servers or Receivers. As many as 26 layers of Point Repeater 9.9 repeaters can coexist in the same environment. The Point Repeater 9.9 can be configured via the 900 MHz radio interface for network specific operation.